5 Senior teams and 4 Junior teams skated their short programmes on Friday afternoon at the Trophy D’Ecosse in Dumfries, Scotland on the first of day of the 3-day ISU competition. The rink was packed out with only standing room available by the time the Senior teams skated and the Canadian team, Nexxice, are currently in the lead with 64.10 points earned in their short programme. The penultimate team to skate, the Canadian team came on to a massive cheer by the enthusiastic crowd. They didn’t disappoint with a very fast, intricate routine to ‘Got your number’ by Serena Ryder. Nexxice has a comfortable lead of over 24 points. In second place are Team Del Sol from the USA. Dressed in pink and orange, they skated to an upbeat ‘Americano’ number which had a few errors and scored 39.16 points. Third place was hotly contested but the current British Champions, Zariba from Scotland gained the bronze with 29.24 points. 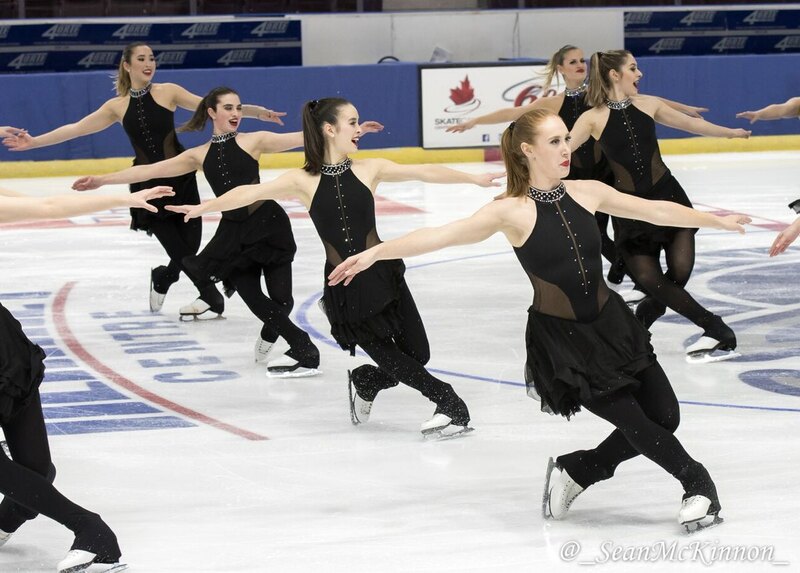 They skated to a contemporary version of the Scottish classic ‘500 miles’ with traditional costumes. In fourth place, skating to Sia’s ‘Chandelier’ are team Spirit from Wales. Dressed in an ombre blue they scored 28.96 points. In fifth place are Wight Jewels from England. They skated to a Bollywood theme wearing pink and purple and scored 25.21 points. There was only one Junior entry, Solway Stars from Dumfries who scored 28.75 in the short programme. While in the Junior B category: Les Chrysalides from France, wearing a pink costume, came first with 28.86 points; Team Destiny from Great Britain came second with 24.92 points; and Team Unum, also from Great Britain, came third with 20.68 points. In the Juvenile category: Silhouettes from Nottingham placed first with 38.84 points; Supernova from Lee Valley placed second with 25.42 points; and Wight Sparkles from the Isle of Wight placed thirst with 20.26 points. In the Elementary category: Ice Pops from Nottingham took the gold with 23.87 points; Altair from Altrincham got the silver with 22.00 points; and Solway Comets from Dumfries received bronze with 19.43 points – a massive improvement from the British Championships. The free competitions will continue on Saturday at 13.54 GMT with the Mixed Age category, Advanced Novice at 15:12, Juniors at 15:55 and Seniors at 16:40.